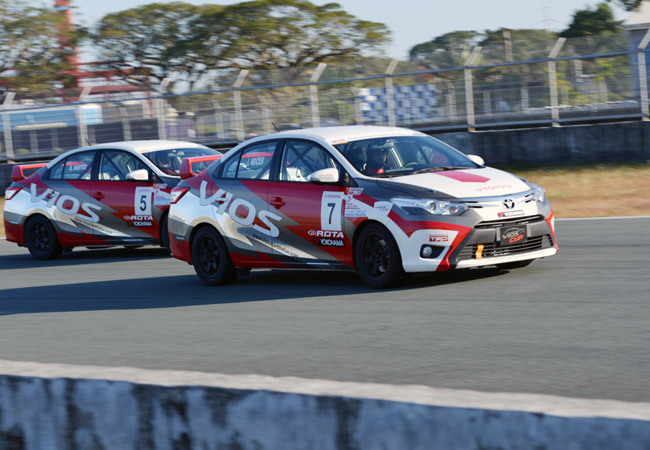 With the recently held Toyota Vios Cup promotional race a huge success, Toyota Motor Philippines has set a very high benchmark for organized professional motorsport endeavors in the country. 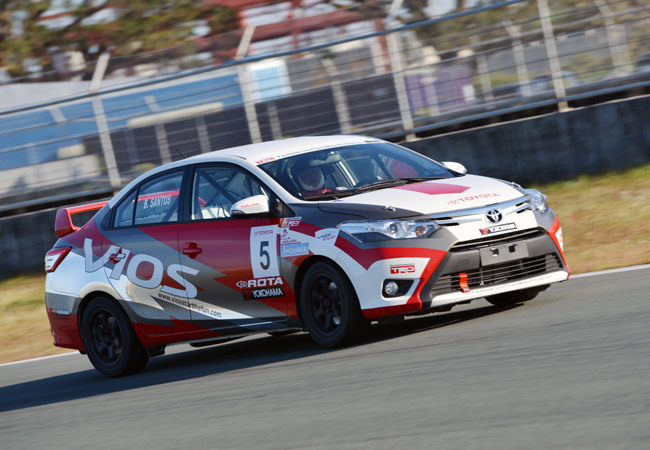 According to TMP marketing vice president Sherwin Chualim, the Vios Cup is TMP president Michinobu Sugata's personal pet project, following the directive of Toyota Motor Corporation president Akio Toyoda to inject fun and excitement back into the brand. What happened wasn't a race, but a full-on festival with something interesting, something new and, most important, something fun and exciting for everyone. TMP invited 12 participants to partake in an exhibition race, composed of five up-and-coming celebrities and seven motoring journalists. Despite intense on-track battles--rivalries on and off the track--the one true star of the event was, without question, the Vios Cup car. 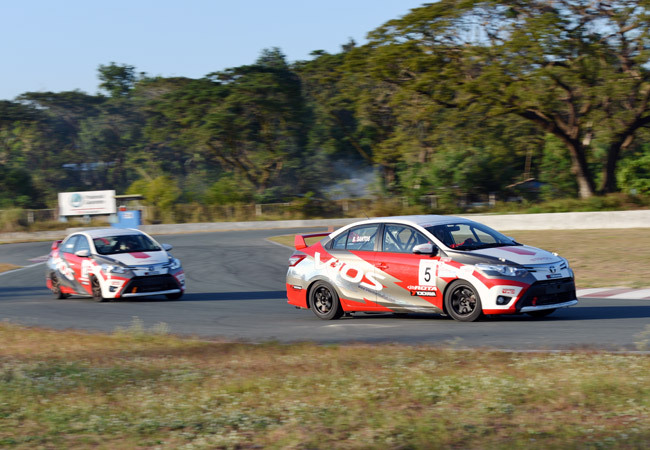 The exhibition race was meant to showcase the capabilities of the all-new Toyota Vios sedan, transformed into an FIA-certified touring car by Tuason Racing School's race engineers and mechanics. It features a massive 12-point roll cage, a singular carbon fiber-reinforced polymer bucket seat, a deep-dish suede-wrapped steering wheel, and an FIA-spec fire suppression system and kill switch all supplied by OMP. The entire interior was stripped save for the dashboard, which had holes cut into it to make way for the roll cage. Most people won't recognize the name Daisuke Ito, but to fans of the Japanese JGTC/Super GT racing series and driving videos from Best Motoring and Option, he is a driving god who is fast, funny and extremely easygoing. 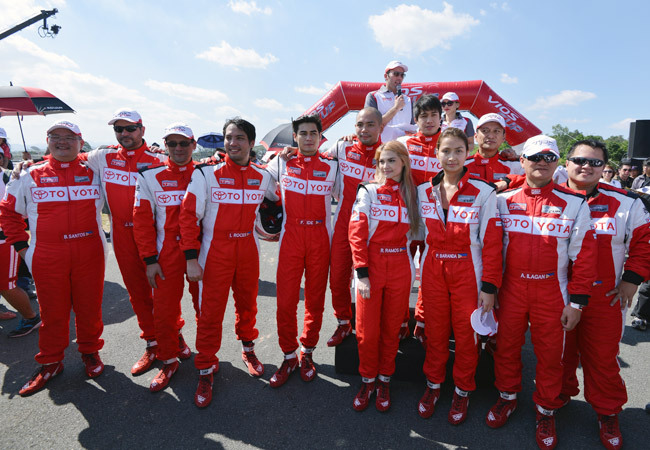 Daisuke Ito is a factory race car driver for Toyota/Lexus TRD, and he visited Clark International Speedway to set up the cars. 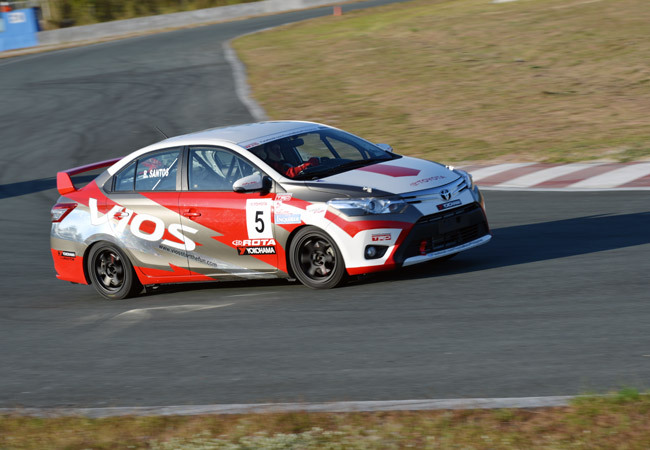 He did a fantastic job as the Vios Cup cars displayed extraordinarily high limits, yet remained benign and comfortable in extremis, allowing everyone to slowly but surely gain confidence in exploring respective limits, including those of the Vios Cup cars. Celebrities invited to participate were TV show host and model Phoemela Baranda; sports host and all-around jock Jinno Rufino; gorgeous half-British, half-Filipino actress Rhian Ramos; Brazilian-Japanese model, actor and hunk Fabio Ide; and matinee idol Aljur Abrenica (who proved to be the single most popular celebrity during the event, being a native of Pampanga himself). Of the seven invited journalists, four were from Top Gear Philippines: design guru Brian Afuang; columnist Aris Ilagan; publisher Jeff Reyes; and myself, who finished last among the media guys. But finishing last among the journalists was irrelevant, because we all had great fun. Brian, Jeff and Aris had much more experience racing wheel-to-wheel, whereas I had only competed in some time-attack style events in the past. And as we would later find out, wheel-to-wheel racing is far removed from simple track driving and competing in simple timed events. The best way to describe it is 50% exhilaration and 50% fear of loss of life or limb. Obviously, skill levels were at a great disparity, so TMP entrusted training again to Tuason Racing School. Training went on originally for three months, and this was where the achievements stood out. Everyone's lap times were shaved like fine ice constantly and consistently, but Rhian and myself lopped off the most time. When Rhian started, she didn't even know how to drive with a manual transmission--let alone around the track. When she finally figured out how to work things, her first timed lap was in the two-minute range thereabouts. I was in the high one-minute 30-second range. But by race day, I was already lapping in the mid 1:16s, and Rhian was already in the high 1:16 to low 1:17 range. Epic achievement for the hard-working guys and gals of TRS indeed! To put things in perspective, eventual winner Vince Pornelos of AutoIndustriya was lapping in the low 1:15s. The race would be run Macau GP style: two heats with the overall winner determined by the combined finishing order. Phoemela Baranda had qualified in first place, which surprised everyone. I qualified a somewhat respectable eighth on the grid for race one. On race day, I lost a place during the start and fared only ninth in the first race and seventh in the second race. But it didn't matter, as I had an intense dogfight on track with Fabio Ide in the last half of the first race, trading places six times on the last four laps. At the start, my added weight versus Phoemela's lighter build gave me a traction advantage, which allowed me to pull alongside of her. I slowly edged her out into turn one and took her spot. I drove furiously until the very end, and Phoemela, who was suffering from sheer heat exhaustion, couldn't muster enough strength to really challenge. Outpacing the pole-sitter during the race must count for something! In the second race, I suddenly found myself bumped up a spot. 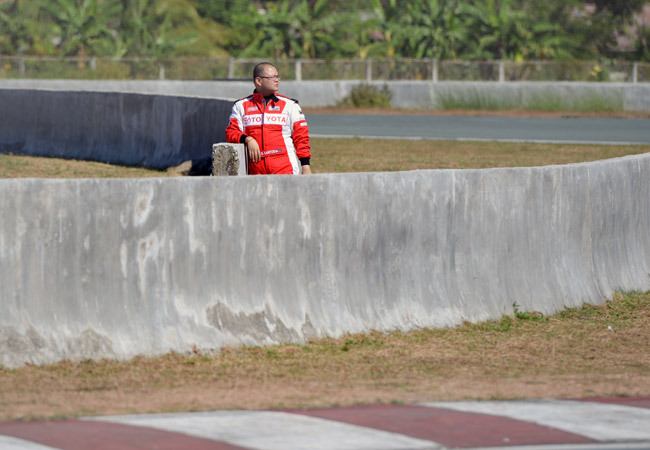 Phoemela had been given a 15-second jump-start penalty and would start in seventh place, while Jinno Rufino had been fined a 30-second penalty for having made contact with Brian Afuang, which gave Jinno a massive royal tantrum. Racing aside, there was much to do for all the people who came out to watch: a go-kart track was made available for free to whoever wanted to try their own skills; car displays, accessories booths, food trucks and reverse bungee were also on offer; all the officially recognized Toyota car clubs had three 20-minute track sessions for free; and after the awarding, there was a free concert featuring Sponge Cola and Ely Buendia. It was also amazing seeing everyone from all walks of life go to Clark International Speedway. 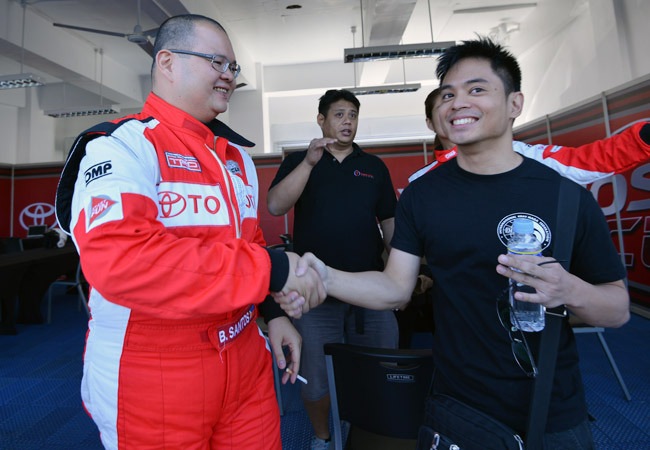 People came to see the Vios Cup cars (either as fans or potential customers for the upcoming series this year), witness their favorite celebrities race on the track, or just join in the festive fun. 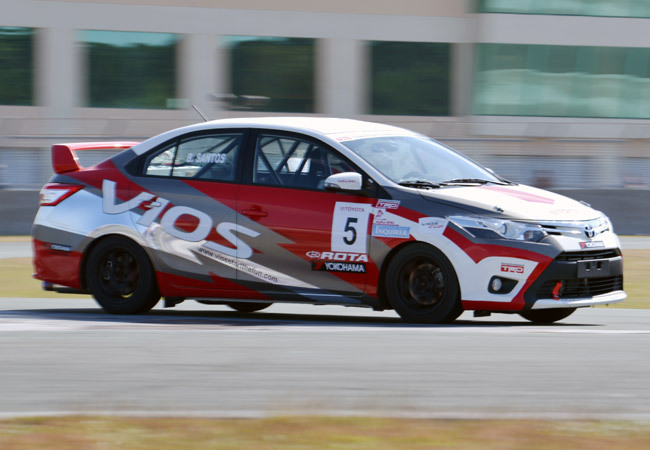 It is this complete and comprehensive atmosphere of fun for everyone that guarantees the success of the Toyota Vios Cup one-make race series.